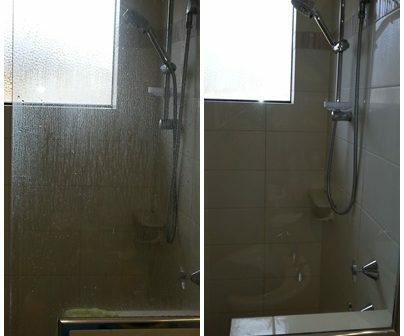 One job we all seem to hate doing, and that is cleaning our glass shower screens of soap scum build-up. We can show you how with just white vinegar & bi-carb of soda you can easily remove soap scum build up and then keep it off for good! 5 easy steps to clean soap scum using off your shower screens just bi-carb of soda, white vinegar and microfibre cloths! Dampen a general purpose microfibre cleaning cloth. Spray neat white vinegar onto glass shower screen. Dip slightly damp general purpose cloth into small amount of bi-carb of soda. Apply directly to vinegar area on the screen. Apply in circular motions. You will notice it will fizz. Keep going until fizzing stops. Re-apply to the rest of the screen. Rinse shower screen and microfibre cloth with warm water. Partly dry screen, finishing off with a glass/mirror microfibre cleaning cloth before completely dry. To keep the soap scum at bay, it is really important to rinse & wipe down after each shower with either a squeegee or microfibre cloth to get rid of any soap residue, body oils, etc. That way your shower screens will keep looking cleaner, longer. Use liquid body wash not soap in the shower & bath tub as the oils and fats in soap create soap scum build up. Since shower gel is basically a detergent, it’s specifically formulated to prevent soap scum from caking up in the shower/bath tub. If you have more than just soap scum (calcium buildup/ hard water staining), then no natural or shop bought products will remove this. You will need professional help. If you would like to discuss further, please call us on the number below or click on the Get a Quote button. 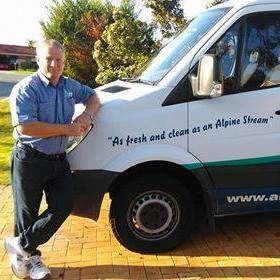 See our Shower Screen Cleaning page for more details https://www.alpinecarpetcleaning.com.au/Shower-Screen-Cleaning-Perth. Please note that this and any other tips given in our D.I.Y blog is to assist you in minimizing any discoloration or staining damage. Please follow instructions and measurements carefully as use of different quantities may have unintended consequences. These tips do not take in account individual circumstances, and we cannot be held responsible for any claim or action that may arise from using the information on this website.